With the now famous opening statement of announcer Vic Perrin “There is nothing wrong with your televison set. Do not attempt to adjust the picture. We are controlling transmission…” the Outer Limits began. In a short run on television of only two years (1963-1965), with 49 episodes, the Leslie Stevens show developed quite a following. Even today it can be classified in the cult status with followers being the most likely purchasers of this (3) CD set. While some of the special effects can be smiled at today, the acting cannot. Robert Culp, Robert Duval, Martin Landau, Leonard Nimoy, and Geraldine Brooks are just a few who participated. Stephen King called it “the best program of its type to run on network TV.” A word of caution: This set has nothing to do with the revived version of 154 shows that ran from (1995-2002), nor does it have anything to do with final 17 episodes, composed by Harry “One Step Beyond” Lubin, including a new theme. This CD set consists of 10 episodes composed and conducted by Dominic Frontiere except for 3 cues in the Don’t Open Till Doomsday episode and the show Tourist Attraction composed by Robert Van Eps, orchestrator and teacher of Frontiere. Some of the material was released in 1993 on GNPD 8032 but it only includes music from 3 episodes along with 16 sound effects tracks from various episodes. The new release includes 10 episodes along with all the variations of the opening and closing voice versions (Vic Perrin) as well as the short and long versions of the main title. While Dominic created a noteworthy motif for The Outer Limits, one of the more recognizable television themes, he’ll always be remembered for the Clint Eastwood Hang ‘Em High film at least by this reviewer. The 1968 film was my first experience with Dominic and I remember both the film and the yellow cover of the United Artist LP well. While I remember seeing all of the episodes of The Outer Limits in the 60’s I don’t recall much of the music except for the Vic Perrin lead in followed by that memorable soundbyte. With 180 minutes of music on the 3 CD’s, including most of the original material (13 of the 32 episodes received original scores), this is a full evening worth of listening. Architects of Fear has a first class heart felt love theme. Featured in the track “Scarecrows” and “Requiem For A Scarecrow” this theme could easily fit into any of 100 different films with a romantic encounter. The Hundred Days Of The Dragon, included in the GNP release, is a Oriental flavor work featuring harp and bass clarinet (remind you of Herrmann?). Both of these episodes took advantage of the 44 piece orchestra, which was used on one occasion in August of 1963. Nightmare, also included in the GNP release, features a chamber orchestra and a homemade oscillator nicknamed “Onafets” (Stefano a writer for the show spelled backwards) to give it a sci-fi sound effect without the use of a theremin. Tourist Attraction, written by Robert Van Eps, features some very generic traditional type Hispanic music as well as some downright scary tracks with the bass clarinet again. This reviewer would love to have the library of videos and books that Randall Larson, writer of the CD booklet, has at his disposal. There is enough information made available about the series, composer, and cues without going completely overboard and offering a book along with the CD set. All in all this is a very nice package! While it is primarily aimed at the fan of the series or collector of Dominic Frontiere it does have enough varied and interesting material to appeal to the general film score collector. At $34.95 it is a nice bargain at less than $12.00 a CD. Recommended. Lately, it seems like Eddie Murphy is on a downword spiral for the worst picture of the year. His last film Norbit qualified for 2007 and Meet Dave is certainly a candidate for 2008. But then Brian Robbins who directed both films and showed a nice profit on Norbit likely has this whole thing figured out a lot better than this reviewer. This time Dave (E. Murphy) is the captain of a miniature spaceship of aliens trying to save their planet. There goal is to try and find this baseball-sized device on Earth which will save their planet. The film also stars Elizabeth Banks and Gabrielle Union. Maybe this reviewer is too far removed from the target market to even think that this is nothing more than a mediocre comedy. However, if the first weekend is any indication of how it will fare at the box-office, it will lose money so maybe there is a little wisdom in my thoughts. Murphy is certainly a capable actor with an outstanding performance in Dreamgirls, released in 2006. Perhaps this is just something to do to get a nice paycheck between voice jobs in the Shrek series? One thing for sure at least at this time in his career: he manages to stay extremely busy. John “Generic” Debney can always be counted on by producer/directors to write material that will fit the plot and not add to or take away from the film, with exactly the right kind of music necessary. This film is no exception. One could very easily produce a series of commercials in a wide genre using the cues produced for this score. “Orb Arrives on Earth” and “Dave’s System Check” have that all too familiar Star Trek, Star Wars, space sound. The orb motif is repeated in “Blast Off and Return” after a loud ear squeaking beginning, as well as on “Mini Dave Apologizes” and “Saved by the Bus.” In fact it was necessary for me to give this soundtrack more than one listen before I picked up on the fact that the motif was featured on more than one track. It is there but extremely difficult to pick it out! “Gina Runs Into Dave” is a swingy little dance number with some nice baritone sax, a laughing trumpet, and bright upbeat string work but no melody. “Whipping Eggs” is a cartoon like little number, cute enough but really brief. With the soundtrack logging in at only 42 minutes for 27 tracks most of them are quite short. Romance is in the air on “Gina’s Painting”, “Dave’s True Feelings”, and a “Kiss in the Park.” They feature what else but a soft elegant piano with strings. Yawn. More comic book hero music can also be heard in “The Battle Begins”, “I am Dave Ming Chang”, and “Saving Earth.” “I’m in Charge” is a landscape military charge. There is nothing wrong with this score. People who are fond of the film, John Debney, or Eddie Murphy will likely enjoy the music as well. However, if your a fan of film music you’ll likely find little appeal to the landscape score that Debney wrote for this film. This music could have been used as part of a NASA tourist tour for the elevator that goes up and down the rocket. Or it could be background material for any number of retail stores or restaurants. All through the first listen I kept waiting for something exciting to happen and nothing happened except a yawn or two. Stick your neck out next time John and take a chance! 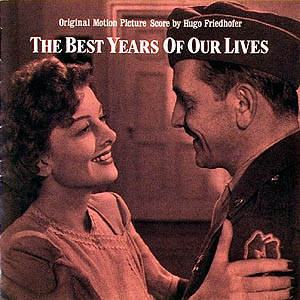 In spite of a title that gives the wrong impression, an irritating predictable plot, and uneven acting at times, The Best Years of Our Lives won (7) Oscars for picture, directing (Wyler), screenplay (Sherwood), actor (March), supporting actor (Russell), editing (Mandell), and Hugo Friedhofer for original score. Adapted from the story Glory For Me by MacKinlay Kantor, well known for his Civil War writings, the 2+ million dollar film( a huge amount for 1946) starred Fredric March, Myrna Loy, Dana Andrews, Harold Russell, and Teresa Wright. It tells the story of (3) servicemen, bombardier (Andrews), infantry sergeant (March), and sailor (Russell) returning to Boone City to their former lives. The film was quite controversial at the time dealing with subjects of divorce, an extra-marital affair, and disability issues. Wyler used over 400,000 feet of film which was edited down to 16,000 feet for the 170+ minute picture using location photography in Cincinnati (home spun USA town shots) and the frightening graveyard of former planes in Chino Ca. for the bombadiers nightmare sequence. Mixed in with this predictable story and corny acting were some of the better performances this reviewer has ever seen making for a heart felt and thought provoking film worthy of the Oscars it achieved. 1946 also saw nominations for original score to Anna and the King of Siam (Herrmann), Henry V (William Walton), and The Killers (Rozsa), steep competition for Friedhofer who originally was not the choice of Wyler. Wyler wanted Aaron Copland or Alfred Newman but it was Newman who convinced Wyler that Friedhofer was the man for the assignment and the result is a warm, nostalgic, and Americana type score in the tradition of something Copland might have written. While it wasn’t orchestrated by Hugo his crew of Moross, Powell, Shuken, and Cutner transformed his work into the masterpiece it is. Friedhofer used leitmotif writing for most of the key characters/situations in the film. In the “Main Title” in a span of 90 seconds he creates the basic mood of warmth, optimism, and the military setting of the film. The second track “Homecoming” introduces three themes Octave, Boone City, and Neighbors which will be used throughout the film in a variety of ways. “Fred and Peggy” features a nice blues theme on the alto saxophone performed by Bob Burns. The sequence relates the too much to drink on the part of Fred as well as the romantic attraction he feels for Peggy. “The Homer Goes Upstairs” track is one of the best tracks this reviewer has encountered in film music! It is a scene in the film where Homer, after talking to Wilma in the kitchen, takes her upstairs to show her the care that will be necessary for him. Hugo uses the Octave theme as Homer removes his hooks and then uses the Neighbor theme in a minor key. Next, surprisingly he immediately switches to the Wilma theme in a major key as she understands and offers to help him. The theme swells to a conclusion as Homer lays in bed in tears of joy. The music absolutely contributes to making the scene! Another scene that absolutely makes a difference is in the “Citation; Graveyard and Bombers”, a track musically which sums up the despair, hopelessness, and then a final closure in Fred’s life, allowing him to move on. The dissonant chords recalling the nightmare of the bombing raids depicts in music the feeling of Fred perfectly. Hugo also wrote an “Exit Music” track to be played to a blank screen (how things have changed) while people left the theater. While it was only used a few times and then abandoned, it was a good conclusion to the picture. As is often the case, the original material was either lost or destroyed, leaving Tony Bremer the job of reconstructing the music from the piano-conductor score as best he could. Originally recorded pre digital era in 1979 this re-mastered version in 2000 used the current technology of 24 bit SBM to improve on the original inferior recording to try to bring it up to average standards. It is definitely on the bright side and by lowering your treble to compensate, you just flatten out the dynamic range. One can only hope that one day someone will take on the task of re-constructing and then re-recording all of the material in this Oscar winning score. In the meantime it is the only available recording and for any serious film score listener it is a must have in your collection. Harry Houdini, the master of illusion, has been the subject of numerous films, documentaries, books, and controversy. The most popular film was the 1953 version Houdini, starring Tony Curtis and Janet Leigh, which took many liberties (as Hollywood does), including his death. Houdini died from a blow to the stomach causing his appendix to rupture not doing the Chinese Water Torture trick as the film claimed. This film is no exception as it comes up with a series of events that have no factual basis other than his wanting to expose psychics who believe they can contact the dead. In fact Houdini had quite a heated argument with Sir Arthur Conan Doyle who did believe in this psychic phenomena. Directed by Gillian Armstrong of Charlotte Gray and Oscar and Lucinda fame, it stars Guy Pearce as Houdini and Catherine Zeta-Jones as Mary the romantic interest. The film took place during the last year of Houdini’s life in 1926. It is set for release in the US in July of 2008. This is my first experience with the composer Cezary Skubiszewski (Two Hands, Lilian’s Story), who is of Polish descent having emigrated to Australia. It is certainly a good one as Cezary certainly got my attention from the very first listen! These are not your typical generic/landscape motifs designed to fit any kind of scene or emotion on the screen but music that is well written and thought out carefully. Cezary can write a melody and one which will stay with you for longer than 10 minutes. “Death Defying Suite” opens the CD with a main theme followed by the Houdini theme, and a Scottish motif for Mary. While the Houdini part is quite jewish sounding with some nice viola and wordless choir work, it nicely transitions into a traditional stoic Scottish melody with first the viola followed by clarinet, and choir and flute. Both melodies are reprised in “The Final Curtain” and are repeated throughout the score in different orchestral styles. There is dance music in the form of pre-swing on “Foxtrot Foxtrot” and a tango in “Maid Does the Dishes.” “Princes Kali” is a fun klezmer style cue complete with zurna, soprano sax, oud, dholak, and piano accordian. This reviewer almost felt that the slow soprano sax solo which started the track was going to burst into a jazz riff! “Star Picture House” starts off with the piano in a “presenting” melody and then seques itself into the love theme repeated slighty more romantic in fashion in “Just Like Falling”, which also features a lute, one I would not associate with Scottish “we bonnie” type of music. The lute in this case worked quite well! The key to the success of this score as a pleasant listening experience away from the film is that there is enough diverse music between the three themes, source, and underscore material to make it interesting. While there are some lively and vibrant tracks this is not one to have to turn the volume down on. While not classical in nature it does lean more in that direction as opposed to some of the more bombastic material. A minor complaint is the lack of track listing time in the CD booklet. Nice effort.